As we all know, Rogue One: A Star Wars Story went through innumerable iterations; some of them you saw in trailers and on the big screen, others never made it that far. 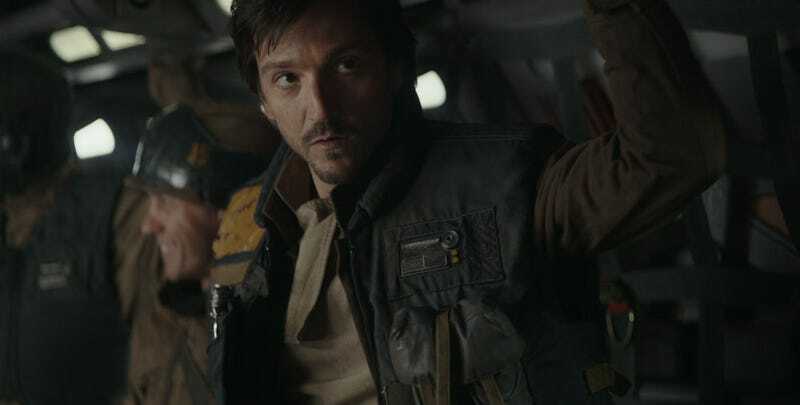 Recently, Rogue One’s first writer Gary Whitta revealed an alternate, happier ending where Jyn and Cassian survived. However, that wasn’t the only alternative ending according to the creator of Rogue One’s story, John Knoll. John Knoll is the Chief Creative Officer and Senior Visual Effects Supervisor for Industrial Light & Magic, the visual effects house that works on Star Wars as well as dozens of other films. He was also the person who originally came up with and pitched the idea of making a movie about stealing the Death Star plans. Before any writers were hired, he came up with several different versions of the story. We were at ILM to talk to Knoll about the upcoming Rogue One home release, but when we asked him about the “happy ending” revealed earlier this week, he gladly told us about a few other possible endings that were considered for the film. These two started the same way, but then broke off into two different paths. That’s one ending Knoll considered. The second idea is largely the same ending but has another layer to it and a twist at the end. And here’s where things get crazy. Then I had a version of it where the Cassian character, originally, was a double agent. He was a spy planted by the Empire into the Rebellion. And over the course of the mission he becomes aware that the Death Star actually is a real thing and it’s not just propaganda. The Empire really built it, intends to use it and its only purpose is a genocide weapon. He realizes a lot of what he’s been told is a lie and that he’s been on the wrong side. So he switches sides to the Rebellion and he realizes he can let everyone live. They’ve got a carbon freeze bomb on the ship and the idea is that he forces everyone into the airlock. “I’m going to set this off and you’re all going to survive.” He sort of times it with one of the hits from Vader’s ship so he blows up the ship and sets off this carbon freeze bomb and everyone is frozen. Then on Vader’s ship they detect no life signs and they think everyone’s dead. And they’re like, “Where’s that ship the plans were transmitted too?” and they go. So I was going to leave our heroes out of the picture. It’s why they don’t show up in Empire or Jedi — they’re stuck in [carbon freeze]. It’s an awesome, if kind of absurd idea. But it also is the type of ending that would have hypothetically worked in canon and allowed Jyn to appear in later works. (If you’re wondering about the other heroes in the film, like Chirrut and Baze, they hadn’t even been conceived at this point.) Even so, it would have been a bit of a cheat and thankfully, as development went along everyone agreed that just killing everyone was a more heroic, fitting, and simpler piece of storytelling. And yet, I hope someone brings the Carbon Freeze bomb back at some point. It’s far too awesome an idea not to use. Rogue One hits digital download on March 24 and DVD/Blu-ray April 4. We’ll have more soon.